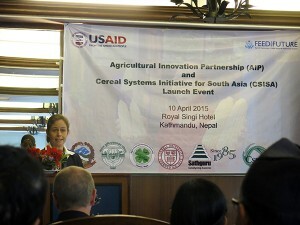 A new investment by the U.S. Agency for International Development (USAID) in the Cereal Systems Initiative for South Asia in Nepal (CSISA-NP) was launched on 10 April, 2015 at a public event in Kathmandu. The investment by USAID India and USAID Washington, totalling US$ 4 million over four years, aims to work with the private and public sectors to benefit smallholder farmers by integrating scale-appropriate mechanization technologies with resource conservation and management best practices. “For a country where 75 percent of the population makes its livelihoods in agriculture, these partnerships are absolutely important. Agriculture development, as we know, is one of the surest routes out of poverty,” remarked Beth Dunford, Mission Director, USAID Nepal at the launch. Eight million Nepalis still live in extreme poverty and almost 3 million Nepalis live in recurring food insecurity. “We also know that growth tied to gains in agricultural productivity is up to three times more effective at raising the incomes of the poor than growth from any other sector,” Dunford added. Beth Dunford, Mission Director, USAID Nepal. The new phase of CSISA-NP, an initiative led by the International Maize and Wheat Improvement Center (CIMMYT), will build on successes and lessons learned from the ongoing work of CSISA Nepal, currently funded by USAID Nepal, and will continue to focus on districts in the mid-West and far-West regions of Nepal. It will complement USAID’s Feed the Future program, KISAN, which works to improve agricultural productivity and incomes for over one million Nepalis. The new work plan will be implemented in close collaboration with the Ministry of Agriculture and Nepal Agricultural Research Council, to strengthen seed value chains for timely access to improved varieties by farmers, promote sustainable intensification of agricultural systems through increasing lentil cultivation and better-bet management, increase wheat productivity using new technologies and better farming practices and facilitate precise and effective use of nutrients to increase crop yield. A specific component of the new investment is designed to support and build the capacity of change agents like medium-sized seed companies, agro‐dealers and mechanized service providers. “Building on its success of working with the Indian private sector, CSISA will expand the program in Nepal to facilitate application of specialized, commercially-viable equipment for small and marginal farmers,” highlighted Bahiru Duguma, Director, Food Security Office, USAID India. “CSISA supports more than 1,600 service providers in eastern Uttar Pradesh and Bihar in India and we want to replicate that success in Nepal of working with local entrepreneurs to help reach farmers with mechanized technologies,” said Andrew McDonald, CSISA Project Leader. Rajendra Prasad Adhikari, Joint Secretary, Policy and International Cooperation Co-ordination Division, Ministry of Agricultural Development, Government of Nepal, welcomed this initiative and said that this launch is very timely as the agricultural ministry has just developed and endorsed an agricultural mechanization promotion policy and the Nepal Agricultural Development Strategy is in its final shape. The launch was attended by representatives from the Nepal Ministry of Agriculture, Nepal Agricultural Research Council, Agriculture and Forestry University and USAID officials and received positive media coverage in Nepal.